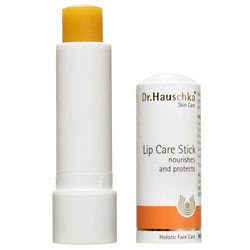 As a lip balm aficionado, I hold a secure spot on my TOP 5 FAV Lip Balm list for Dr. Hauschka Lip Care Stick . I've been using this one for years and I'm kind of hooked on the herbal flavor and silky smooth texture. This all natural lip care comes in a stick or tub but I prefer the convenience of the stick. When your lips are begging for balm, make an appointment with Dr. Hauschka. Ingredients like Shea butter and Jojoba wax keep lips moisturized, protected and feeling good while extract of carrot and anthyllis soothes and softens. You can find this lip balm at sties like drugstore or amazon. Dr. Hauschka's website states that the Lip Care Stick does not encourage product dependency.... Yeah right! I love this lipbalm too. The consistency is perfect and soothing. Totally agree with you and the herbal flavor is very nice too.